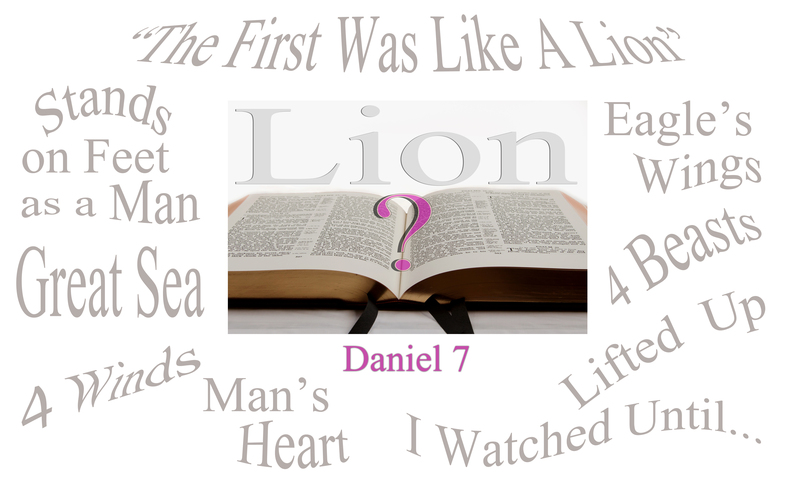 Daniel’s Vision and The Lion of the Tribe of Judah – A Lion Has Roared! The Lion with Eagle’s wings in Daniel’s vision is an important Bible prophecy representing the nation of Judah and clearly showing both the first coming of Jesus Christ in humility and His second coming in glory. Daniel spoke, saying, “I saw in my vision by night, and behold, the four winds of heaven were stirring up the Great Sea. (3) And four great beasts came up from the sea, each different from the other. Daniel had a dream that is filled with mysterious images. We may think it is impossible to understand his vision, but the Bible can explain all these symbols. Here we are going to see the Bible’s clear explanation of the first Beast of Daniel’s vision—the Lion with Wings of an Eagle. Daniel understood this lion. So can we. Every student of Bible prophecy knows about King Nebuchadnezzar’s dream in Daniel 2. God gave the king a vision of a great image with a golden head, silver arms and chest, bronze belly and thighs and legs of iron. Nebuchadnezzar saw the image in his dream, but by morning, he had forgotten the dream and all that he had left was a lingering sense that he had seen something important. The king issued a decree to all of his mystics to reveal to him both the interpretation of this dream, as well as the dream itself, or be put to death. God used this vision in a special way to introduce the king to Daniel, a captive taken from the royal family in Jerusalem and recently brought into the Babylonian capital city of Chaldea. (Daniel 1:3, 6) Daniel prayed to the true God of Heaven to reveal the meaning. From that moment on, Daniel was given the gift of being able to interpret all dreams and visions (Daniel 1:17). Nebuchadnezzar had gone to bed that night with thoughts in his head about what would happen to the kingdoms of the world after him. (Daniel 2:29) God gave him a view of the progression of worldly kingdoms all the way down to the Second Coming of Christ. Daniel explained to the king that the head of gold represented both Nebuchadnezzar and his marvelous kingdom there in Babylon, but that his kingdom would be succeeded by kingdoms of dwindling magnificence until a great Stone would smash the image on its feet and all the kingdoms of the world would be dissolved. That stone represented God who would bring all earthly kingdoms to an end before He turned the kingdom over to the Saints. We have the benefit of both Daniel’s interpretation, as well as world history, to see the kingdoms that were represented by the great metal man of Nebuchadnezzar’s vision. Represents Which Kingdom of the World? But where in all this sequence of kingdoms is God’s nation of Israel? Why are they left out of this list? And what kind of a vision did God give Daniel when he lay awake at night with thoughts about what was going to happen in the world arena? Daniel, there in Babylon, a captive from Jerusalem, turned his mind to thoughts about his own people. It is no coincidence that Daniel’s own vision came to him in the first year of King Belshazzar. Nebuchadnezzar had acted as God’s servant in taking Jerusalem into captivity. (Jeremiah 27:6, 1-11) He continued acting as God’s servant when he set Daniel, Hananiah, Mishael and Azariah in key positions within the government. Here we see Daniel’s promotion. The names of his companions have been changed by the king. The understanding of the symbols in Daniel’s dream was given to him by God. And God has also provided understanding for us by revealing these symbols to us in Scripture. Here we are going to look to Scripture to show us symbolism and history that will reveal the part played by the nation of Israel in world events, all of which will ultimately show us a glorious picture of Jesus as the world’s Redeemer! Wind = the Hebrew ruach. It is used seven times for the Four Winds of Heaven: Jeremiah 49:36; Ezekiel 37:9; Daniel 7:2, 8:8, 11:4; Zechariah 2:6, 6:5 [which says “four spirits”] There are other mentions of these Four Winds in the New Testament in Greek: Matthew 24:31; Mark 13:27; Revelation 7:1. It was God’s Spirit that would bring the Nation of Israel back to life. The first clue we have about the meaning of the “Four Winds of Heaven” is that they are directed by the Spirit of God and would be instrumental in restoring the nation of Israel. Would these Four Winds also provide for the rise of other nations? That question is answered by the fact that Daniel sees 4 distinct Beasts arising when the Four Winds of Heaven Blow. We get another clue about meaning of the Four Winds of Heaven in Zechariah. Scripture uses the “Four Winds of Heaven” to show that God would scatter the children of Israel across the globe. The number “four” shows that they spread out and encompass the whole world. This is also seen in another place in Scripture. In the Garden of Eden, God divided the river so that it would spread out into the four directions of the compass. (Genesis 2:10-14) “The four corners of the earth” is a common saying today and it gets its origin here from Scripture. “Peoples, multitudes, nations, and tongues” describes the inhabited places of the earth. At last we are given a definition of the symbols of the “Sea” and “Earth” that are used in Daniel. And these tie in seamlessly with the Four Winds of Heaven. The Spirit of God will blow over the whole face of the earth and raise up Beasts out of the mass and population of the earth. When He spoke of kingdoms rising against kingdom, He was showing the changes in the world powers as shown here in Daniel. At some point, this change in world powers will signify the beginning of the end. Exactly which kingdom will be the last, and will signal the end, is explained by understanding which kingdom is represented by the lion of Daniel’s vision. Since it is the first in a succession, this lion kingdom will help establish the timeline for the appearance of these other kingdoms. And there will be further information about the timing of these kingdoms when Daniel’s vision continues in Chapter 8. And as a third test of the timing, a look back at history will firmly establish the identity of all of these kingdoms that are represented by the Four Beasts in Daniel’s vision. So it is important for us to understand this first kingdom of the lion if we want to follow the timeline down to today’s events. The Bible also tells us that God is responsible for the rise of these kingdoms. As we saw, it is the Four Winds of Heaven that bring them up from the sea. These kingdoms are going to end with the kingdom being given to the saints of the Most High. This is the “good news of the kingdom” that Jesus spoke of in Matthew 24:14. He said that this would be the last message to go to the world. In this vision, Daniel received the answer to his question about the fate of his people Israel, just like the king did when his dream revealed the metal image. The Bible shows that the lion represented the Tribe of Judah. Loosely, this includes the entire nation of Israel. Let’s go back and look at an ancient prophecy in Genesis. “Judah, you are he whom your brothers shall praise. Your hand shall be on the neck of your enemies. Your father’s children shall bow down before you. “Judah is a lion’s whelp. From the prey, my son, you have gone up. He bows down, he lies down as a lion; and as a lion, who shall rouse him? “The scepter shall not depart from Judah, nor a lawgiver from between his feet, until Shiloh comes; and to Him shall be the obedience of the people. “Binding his donkey to the vine, and his donkey’s colt to the choice vine, he washed his garments in wine, and his clothes in the blood of grapes. Genesis tells us Judah is a lion’s whelp. Bible scholars, both Jewish and Christian, have long agreed that “Shiloh” is the Messiah. Already in Genesis we are beginning to see a story about how the nation tribe of Judah will bring forth the promised Messiah. Ezekiel also had a vision about a lion who represented God nurturing the nation of Israel. Ezekiel 19: “Who is your mother? A lioness.” She raised up one cub who was taken captive in Egypt. So she raised up another cub who was taken captive in Babylon. This parable is another way of showing God in His work of raising up the nation of Israel and setting it among the other nations of the world. “The Lion, king of the forest, is a fitting symbol of this tribe, from which came David, and the Son of David, Shiloh, the true ‘Lion of the tribe of Judah,’ to whom all powers shall finally bow and all nations render homage.” E.G. White, Patriarchs and Prophets, p. 236. Daniel also knew that the eagle’s wings represented God when He carried His nation out of captivity. God Himself declared this during the Exodus from Egypt. Judah is the lion. The eagle’s wings on its back show God delivering it out of the captivity in Babylon just as He had done when they were captive in Egypt. Here we find Judah currently in captivity and Daniel is longing for their deliverance. When Daniel saw the lion being carried on the wings of the eagle, he knew this was a prophecy about God delivering them out of their captivity. Daniel never questioned this part of his vision. Time passes. Eventually this lion with eagle’s wings will undergo a transformation and will take on a different form. The reason this lion kingdom is going to transform, dates back to a promise that God made to King David. This promise is the reason behind many historic events in Israel’s past. So Daniel continues to observe this Lion with Eagle’s Wings until its amazing transformation takes place. The wings are plucked off and it stands on its feet as a man. The nation of Israel, specifically the tribe of Judah, has been carried out of captivity in Babylon on the wings of the Great Eagle. It is restored to its place among the nations of the world. But eventually, it will transform into the picture of a man, standing on two feet and given a man’s heart. Jesus took on the form of humanity so that He could redeem us. Only a blood-relative could buy back our rights to our estate on earth that Adam had relinquished to Lucifer in the Garden of Eden. But Jesus was so much more than just a man. He came to earth in the degraded form of sinful man and was tempted in every way that we can be tempted, yet He lived His life without sin. In this way He was also able to show us that we cannot claim our sinful birth as an excuse to continue on in sin. We too can lead the life that He led if we would submit ourselves to the control of the Holy Spirit as He did. He is able to sympathize with all our infirmities. This is why we see this lion given the heart of a man. This scroll, sealed with seven seals, here in Revelation is the Book of Daniel which only Christ Himself is able to unseal. Only as a Man could He accomplish this work of progressing the world events until at last He can take on the Kingdom and give it to the Saints. Only as a Man could He become our King. The story found here in this Lion Beast of Daniel’s vision, is the deliverance out of captivity for the nation of Judah so that it can fulfill God’s promise to David to bring forth the Messiah out of his lineage. This nation of Judah is delivered from their captivity on the Eagle’s wings, just as they were delivered out of Egypt. They continued on for the probationary period given to them in Daniel 9:24-27. At the end of this time, Jesus had come. The kingdom of the Lion in Daniel 7:4 spans this gap of time between the deliverance of Judah out of Babylon until the nation brings forth the Messiah at the first Coming of Christ. This chapter of Daniel 7 is one of the few places in the Bible that clearly shows both the first coming of Christ in humility and humanity, and also His second coming in glory when to Him will be given “dominion and glory and a kingdom,” and “the saints of the Most High receive the kingdom and possess the kingdom forever, even forever and ever.” These two comings of Christ were misunderstood by the Jewish scholars, causing them to miss the first coming of Christ in humility. This misunderstanding will also cause future generations to be misled by the appearance of the antichrist in the last days. Let us pray for wisdom in all those who heartily seek truth. The true understanding of this Lion in Daniel sets the time frame for all the beasts that follow after the Lion. This brings the book of Daniel down to the very end of time when it will rekindle as a light shining on last day events. This portion of Daniel’s vision has been sealed until today as explained in Daniel 12:9, “Go your way, Daniel, for the words are closed up and sealed till the time of the end.” If God has chosen today to unseal this vision, He must know that the time is at hand and we have a need for this information. May God bless all who study this prophecy and may He give us understanding of what this timely message means to an end-time people. “By His life and His death, Christ has achieved even more than recovery from the ruin wrought through sin. It was Satan’s purpose to bring about an eternal separation between God and man, but in Christ we become more closely united to God than if we had never fallen. In taking our nature, the Saviour has bound Himself to humanity by a tie that is never to be broken. Through the eternal ages He is linked with us. ‘God so loved the world, that He gave His only-begotten Son.’ John 3:16. He gave Him not only to bear our sins, and to die as our sacrifice; He gave Him to the fallen race. To assure us of His immutable counsel of peace, God gave His only-begotten Son to become one of the human family, forever to retain His human nature. This is the pledge that God will fulfill His word. ‘Unto us a child is born, unto us a son is given: and the government shall be upon His shoulder.’ God has adopted human nature in the person of His Son, and has carried the same into the highest heaven. It is the ‘Son of man’ who shares the throne of the universe. It is the ‘Son of man’ whose name shall be called, ‘Wonderful, Counselor, The mighty God, The everlasting Father, The Prince of Peace.’ Isaiah 9:6. The I AM is the Daysman between God and humanity, laying His hand upon both. He who is ‘holy, harmless, undefiled, separate from sinners,’ is not ashamed to call us brethren. Hebrews 7:25; 2:11. In Christ the family of earth and the family of heaven are bound together. Christ glorified is our brother. Heaven is enshrined in humanity, and humanity is enfolded in the bosom of Infinite Love.” E.G. White, The Desire of Ages, p. 25.